Karl Haas Interview with Bruce Duffie . . . . . I am happy to say that WNIB carried Adventures in Good Music for many years. Always at 7 PM Monday through Friday, it garnered a large and enthusiastic following, and some people even seemed to think that Karl Haas was sitting right in our own studio each night. We would get calls and letters, most of it completely positive about the ideas and selections he presented. On a few occasions he did come to Chicago and gave “concerts.” These were really programs in his usual fashion with illustrations played by him at the piano and expanded into a longer time-frame. But they were always sold out and provided a bit of financial help to the station — which is one of the reasons he went around the country doing them. He did a lot of good for music, and since his death in 2005 there is an annual prize named for him. This conversation was held during his visit to Chicago in the fall of 1989. It was interesting to chat with someone who was so very involved with expanding the horizons of classical music from this perspective which is very different from most of the other musicians I have spoken with over the years. He was occasionally witty, but uncharacteristically serious about the topics I raised, and had strong opinions about people and ideas. Here is that chat . . . . .
Bruce Duffie: You mention on the air the great diversity of your audience. Is this really true, that you have people from all walks of life listening to your program daily? Karl Haas: According to the mail, it’s true, yes. BD: I assume the response you get for various programs will show you the different aspects of your audience. KH: I have never worried about aspects. I do what I love doing and hope that there are people out there who catch fire — and judging by the mail and by personal experiences, there are. I just played in Fairbanks, Alaska, and afterwards a young Air Force Lieutenant came to see me. He listens through the Armed Forces Network and serves on the outermost of the Aleutian Islands which borders on Siberia. He came two thousand miles by plane to listen to the concert. And then, of course, there are the truck drivers that prompted the bumper sticker contest. I’m happy to say it lays to rest the fallacy that only people who have money and an education enjoy this kind of music. I have never heard a bigger piece of baloney in my life! If music doesn’t belong to everybody, I don’t know what does. I’m not speaking of the social element, I mean society associated with symphony orchestras, who go to be seen. BD: Are you part of the cause of bringing classical music to many, many people who otherwise wouldn’t think about it? KH: I have never, never thought about it that way. As I say, I do what I love doing. If that’s the way it works out, so much the better! People ask me, “Whom do you address yourself to?” The microphone. I have no ambition to address myself to any particular group. I’m certainly as happy knowing that I have in the audience people who can’t afford tickets to the Chicago Symphony or the New York Philharmonic, than those who support it — for which we’re all grateful — but who also, shall I say, alienate by their behavior those who really love music and cannot afford it and feel inadequate to come to concerts. BD: So you’re helping to break down barriers, then? KH: I would hope so. It’s high time that we do that. It would be so much better if the finest conductors in the world would turn to the audience once in a while and say a word, or not growl when somebody comes late or unwraps a cough drop. They take themselves so seriously! BD: What advice do you have for a young musician who wants to go into a career as a conductor? KH: First of all, it’s time that he be American-born and not transplanted. Listen to who’s talking! I mean, I wasn’t born here. But who isn’t coming here from a foreign country, not understanding American ways and demanding huge salaries. We have American conductors who are very gifted, and Leonard is a fantastic example for that. I’m not saying that there shouldn’t be any foreigners. Right now we have a terrible shortage of conductors. A terrible shortage! KH: I think the jet plane has a lot to do with it. They jump from one place to another. I was very close to Eugene Ormandy, and he made it a point to say that his main concern at all times was the Philadelphia Orchestra. He never guest conducted except before or after the season. He was there for the entire season! He took breaks, of course, and had guest conductors, but he was in town. BD: So he oversaw every aspect of it? KH: Every aspect of it. I don’t believe in conductors who only spend eight or twelve weeks. I’m sorry. That’s doing the community a great wrong. BD: So we should have an American-born and American-trained conductor, who spends his whole season with an orchestra? KH: Yes. He can travel all he wants, but the orchestra should know that they belong together! I know so many people who transplant their families, and the family isn’t necessarily happy. I’m not touching their standing as outstanding musicians, but the time is gone now that we have to engage people who had their training in Europe, or who have an accent because it appeals to certain elements of the society. We have American-born conductors who are exceedingly talented. How long has it been, now? I first met Bernstein in ’49; he was the Jackie Robinson among conductors. KH: And that’s where it ends. I’m not saying this for parochial reasons, but it’s a phenomenon! BD: My main complaint about the orchestra is that they don’t play enough American music. Slatkin brings in American music, and there’s quite a bit being done. They’ve commissioned some pieces. Ellen Zwillich wrote a trombone concerto last year, and she’s writing another one. KH: Don’t you honestly think that an American-born conductor would ipso facto have a greater interest for American music than somebody who comes from Europe? They’re not in the mainstream of American life. You can’t be if you jump around like they do. We expect so much more of a conductor than people do in Europe. KH: A conductor in Europe conducts and does the best he can. For instance, I met Carlo Maria Giulini, who —as far as I’m concerned, if I may be so bold — is probably the greatest conductor the Chicago Symphony ever had! Certainly he is the only real, natural successor to Karajan. Outstanding conductor, this man! I met him years ago in Amsterdam and he said, “I’ll never come to America.” I said, “Why?” “Because I cannot do all the things that are required. I’m not a social butterfly. I’m not a party-goer. I’m not a fundraiser. I’m not a public figure. I would pledge to do the finest possible concerts I know how, but the rest I’m not made for.” Well, you know what happened when he came, after a while. I’m sorry to be so outspoken on that subject. BD: No, it’s good to have strong opinions on this. What about the “run of the mill” musician? Suppose someone wants to grow up and be a violinist or a bassoonist in an orchestra. What advice do you have for that kind of person? KH: Oh, there’ll always be room for outstanding people. It’s difficult, of course. It’s much easier to become a violinist than a bassoonist because there are only two bassoons in the orchestra, and there are twenty violins in the orchestra. I remember having guest conducted the Detroit Symphony, for instance. At the rehearsal we did the Meistersinger Overture and there’s a wonderful three-layer theme that Wagner ingeniously interweaves at the end. Personally it’s always been my habit to turn to the tuba and the celli and the double basses, because they carry the main theme at that point, around which the other subsidiary themes are woven. So I hear this magnificent tuba sound, and I looked and I couldn’t see anybody behind the stand. All of a sudden, on either side of the stand I see the cheeks puffing out. It turned out to be a young girl who played the tuba. She was engaged because the regular tuba player couldn’t play, so she was a substitute. Wonderful musician! I went back after the rehearsal to see her and I said, “You know, I couldn’t see you; I could only hear you, and I was crazy about what I heard.” She said, “If only I could get a job. All I do is substituting.” About three months later or so, I conducted in Saginaw and I didn’t have to look; there was that same sound. The same girl again was substituting. Now here is a young black girl, incidentally, which is neither here nor there, who simply cannot find a job because, as you know, there is only one tuba in each orchestra. BD: Are there not enough orchestras? KH: Sure, but there are not enough people who are getting old enough to retire, I suppose! [Both laugh] I think the field is wide open in orchestras, provided that we have a future for orchestras. BD: Are you optimistic about the whole future of concert music? KH: Yes, I am. Very much so, and I’m glad you don’t call it “classical” because it’s a misnomer; it scares people away. There’s nothing classical about music. I call it “good” or “bad.” Those are the only two kinds of music we have to worry music. Good music you cannot kill; bad music you cannot elevate. Good music is synonymous with innate greatness that makes it survive. That’s what classical really means. That’s what we mean by “classical.” But so many people are turned off by that term! They feel they don’t have enough education for it. I know commercial stations — one in New York, for instance — where in my own program I hear commercials that say, “If you listen to this program, you must be well-heeled. You must be well-educated in music. Therefore, our product,” which happens to be a foreign car or something, “is for you.” I could crawl the walls when I hear that! BD: That’s diametrically opposed to what you’re trying to do. KH: Completely! Fortunately I don’t belong to any one station! But I think there’ll always be a future — not only a future, but a great future for concert music. What we need to watch out for, however, is that communities can afford the fees that are being asked. I’m all for members of orchestras getting fees commensurate with their experience and their quality. If the scale for the rank and file is fifty-two thousand dollars a year, they deserve it! But no conductor deserves a million dollars a year; none! I think it’s unconscionable! BD: Even if he draws in the audience? KH: Yes, even if he draws in the audience. Such a conductor would draw in the audience at half the fee, too. And it isn’t only conductors; it’s also the soloists. The budgets will kill an orchestra! And it’s getting higher and higher and higher! BD: Shouldn’t the average violinist be paid what the average third baseman or the average fullback is paid? KH: Well, you’re talking about an American phenomenon. You can’t expect — for one thing, the baseball season is far longer and more lucrative, even given the seasonal aspect of it. There are maybe two thousand seats in an orchestra hall? You can’t compare those two. Sports cannot be compared with cultural values from the standpoint of income. BD: I’m not talking about worth, but shouldn’t they receive that kind of level of dollar remuneration? I’m drawing a very fine line, of course. KH: It’s rather recent that a baseball player or a basketball player is hired for five years at a million dollars a year. I think it’s insane. BD: Those salaries are just for the stars, but the average players are getting three hundred thousand or so. KH: I’m going on record saying that if I would ever earn more than a half a million dollars a year, I would be more than happy to establish scholarships for poor students. I’d give it away. Nobody needs that much money! I’m not talking about a city like Chicago or New York or Boston or Philadelphia, but comparatively smaller cities. Commerce and industry are no longer willing to contribute toward the overall kitty! They simply won’t be able to make it. I lived in Detroit for many years before I moved to New York, and I served as Chairman of the State Council for the Arts under four governors. I thought that perhaps we ought to start something for the major orchestra in the state, to have them travel in the state rather than in Europe; have them serve the state. Well, the Governor and everybody concerned thought that was a great idea, until I got to hear from the Grand Rapids Symphony and the Saginaw Symphony and the Flint Symphony. We have to draw the line someplace. I think a great orchestra in a state — perhaps the Chicago Symphony because I’m now talking to you in Chicago, and you have a fantastically great orchestra — but if the Chicago Symphony would limit its travel to serving the state of Illinois rather than appearing in Europe or going behind the Iron Curtain, what’s accomplished by that? Let’s serve our own people. BD: Why shouldn’t we do both? KH: If it can be done, I’m all with you. BD: ...then they go to Europe every couple or three years. So that’s the ratio. KH: Don’t misinterpret what I say, now. It’s true of every major orchestra. Those European trips are great, but in the final analysis they constitute an ego trip for the conductor, and I am not speaking of any specific conductor now. However, if you talk to the men in the orchestra, they’re the ones that lose money. They have to give up teaching schedules. They get per diem, but they’d sooner be close to home and supplement their income. I remember serving in Berlin in the early sixties as head of the Ford Foundation for some cultural projects. The Pittsburgh Symphony came through on a tour from Russia on the way back to America, with William Steinberg, who was a major conductor. I invited some officials from Berlin to come to the concert. They couldn’t get over it! Pittsburgh??? Who ever would think of Pittsburgh? I mean, such an orchestra! Fine. The next day it’s forgotten. That was a natural because it was en route, you know, but European travel for a hundred people is a very, very expensive project, and somebody has to foot the bill. BD: Most children are growing up listening to only rock music. KH: Well, that’s of course the order of the day. BD: How do we get them to come into the concert hall more often? KH: I get a lot of youngsters. BD: How do we get even more? KH: For instance, yesterday I did a program here at the high school, and there were three hundred students there. I had my trepidations if they would listen to me, but they stayed to the end and they cheered, and they want to come to the concert tomorrow night! It depends. You see, herding young people into a concert hall isn’t going to do much. Young people’s concerts have never been that great an idea, in my mind, because it’s not their habitat to sit in an auditorium. They throw spitballs! [Both laugh] I just started a pilot program on a farm in Oregon. Nobody got any salary for it; everybody donated their services, from the Oregon Public Television to the teachers of the University of Oregon in Eugene. They have a wonderful youth choir, ages eight to eleven that travels in the state. I had them come to the farm which is owned by friends of mine, a young couple. We did all kinds of things. The children performed. I had gone to Norman Dello Joio, one of our great American composers, and explained what I was going to do. He said, “You know, I’ve got just the thing for you. I was just commissioned by the Teacher’s Association of Texas to write a piece for them. It’s for piano duet, and halfway into the duet there’s a unison children’s choir singing a prayer for peace.” I said, “Norman, let’s try it.” He got it out; we tried it and I flipped out! I sent it to the conductor of the choir in Oregon. It’s on the pilot tape. I played the duet with a ten year old little girl and she was terrific! When we got through, I tried to explain to her. How do you explain to a ten year old what I pilot is? I said, “You know, Lisa, when this is going to be a series, I won’t be playing with you.” She cried! “You mean I’m not good enough?” I said, “You’re terrific!” “So why won’t you play with me?” I told her, “Because we’re going to invite the composer to come play with you.” She said, “But composers are dead!” [Both laugh] That pilot is now waiting to be shown around. In fact I had a very attractive offer from the chairman of the board of one of our big companies to put the pilot on the air. I said, “I’m awfully sorry, I have to refuse.” He said, “What kind of guy are you?” He wanted to finance the kick-off. I said, “We have to have a series before we can kick it off. If I accept your generous offer, it’ll be a one-time thing, and then it fizzles. Let me get enough money from other sources to have a series, and I’ll be more than happy to have you kick it off!” Children don’t get music anymore. I ascertained through the music educator’s national conference that almost forty-eight percent of our schools have no more music. KH: No. So you ask about the future of concert music. Who’s going to go to the symphony twenty-five years hence if we keep on going like this? We have no support from the national government, none whatsoever. BD: The endowment doesn’t do anything for this? KH: The endowment is being cut right now, again. Mr. Bush announced that the endowment will have to be cut in order to make room for other things. In the final analysis, we don’t want the government in this. That’s what sets America apart from the rest of the world. But let’s find a sane way to create a continuity of an audience before we worry about conductors and orchestras and their future, because if there’s no audience, the whole thing is going to be ludicrous. BD: Send the White House some of your daily broadcasts! KH: As a matter of fact, I was at a State Dinner at the White House. This was during the Reagan Administration. One day I had a letter on White House stationery saying, “Love your show. Come for lunch.” That was not by the President; it was signed by one of his main speechwriters. He took it for granted, since the program is heard in Washington, that I lived there. So I got on a plane, and went. He took me to the White House mess for lunch and he was crazy about the idea! He said, “Let me talk to the proper people within the government.” But unfortunately, that was not too long before the changeover and now we have to start all over again. But I do think that there’s some encouragement in the wind. I read in the New York Times that it is almost certain that Sharon Rockefeller, who is the wife of Senator Rockefeller of West Virginia and the daughter of Senator Percy, the Illinois Senator has just been nominated as president — I believe it’s president — of the Public Radio station in Washington. I happen to know Mrs. Rockefeller, and she has a keen interest in all this. So maybe if we find enough people to come with her and support that idea, we can do something for children. This is a burning desire that I have, to do something for kids! I conduct symphonic arrangements of “Yesterday” and “Michelle.” Those are lasting tunes! Those are Beatle tunes which have become classics. You see, it’s a matter of semantics here. They’ve become classics! That’s all right. I have basically nothing against rock, except the decibels. This is okay. Even if they may not have a desire, I think children have a birthright to know that there’s another kind of music. And if only a small percentage will eventually turn to that other kind of music down the road, then we have a future. But if we keep it from them it’s hopeless. BD: So it’s all encouragement? KH: I think so. Well, you know, I have been in love with music since I was six years old. There was never any question in my mind as to what I wanted to be. I’m lucky! I never had to ask, “What’s going to happen to me? What will I do?” I was going to be a musician come hell or high water — and both came! There were lots of stumbling blocks; it was a tough road. So it’s only natural that I want to make sure that I contribute whatever little I can toward a continuation of something which is today, in my humble opinion, the only medium that unites rather than divides. I’ve suggested to the White House—I don’t mind telling you this — that every so-called summit meeting start and end with music; music by the host country or any other participating countries. Give it a round so that these so-called leaders, who have in the tiny palm of their hand the fate of the world, the fate of how many missiles or warheads we should have left in order to eventually retaliate or destroy this old globe on which we live; that they’re aware of the risk of losing an age-old civilization of which they know nothing! Do you remember when Mr. Gorbachev was at the White House, and Van Cliburn played? KH: Do you remember how his face lit up and he started singing along? Well, once you get would-be adversaries to do that, you’re far further ahead than with mere words and treaties because you’re touching a human nerve. BD: Maybe you should make a new bumper sticker: Peace Through Music. KH: Well, it’s not a bad idea. You see, every other medium, every other discipline or activity within our cultural life, has the spoken word. Music doesn’t need it. Music is something — the only thing, really — that unites rather than divides. This is why I labor the way I do, because it is a fantastic future! You ask me if there any hope. If there is no hope through music, then there’s no hope through anything else. BD: But you feel there is hope in music? BD: You were mentioning the conductor that stays around for years and years, all season for a long time. We had that for years in Chicago. Frederick Stock was here; he lived here, and worked here. He was the principal conductor, and a couple of years he was the only conductor. KH: And then you get Muti, who denies that there’s such a thing as a Philadelphia sound! How can you? BD: Stokowski built that up for so long! KH: He had the longest tenure — forty-five years as the head of an orchestra. Then Ormandy was unbelievable! BD: Koussevitzky was a great champion of American music. KH: Yes, he was. So was Ormandy. I just recorded a program which will honor the ninetieth anniversary of his birth, and I purposely stayed away from all the things that he became wrongly, exclusively associated with — Tchaikovsky, and so on. I started out with the Shostakovich First Symphony, which he brought to America. I did the Barber Violin Concerto which was first performed by Ormandy with Spalding. I did one of the Symphonic Dances of Rachmaninoff, which Rachmaninoff dedicated to Ormandy. And I read the exchange of letters between the two; they knew each other well; also Sibelius, with whom he was on very friendly terms. I purposely concentrated on twentieth century music. I think he was a giant. BD: I’m always very glad when your programs include music of American composers. Even in your show, they’re few and far between. You should sprinkle a little more. KH: Yes, you’re right. Very definitely, should be more. Depends on the theme. You have no idea what I’m up against. I have this truck driver’s thing. I had a scathing letter saying, “Are you going to be the Archie Bunker of music?” Here was a person driving very heavy loads on big rigs, trucks, all over the country. “And you talk about gentlemen of the road? I’m a woman, and I drive a big truck!” Or I do a program about music as a result of conjugal love. I promptly get a letter asking about love between the same sexes. BD: There you’ve got a whole Benjamin Britten program at your fingertips! KH: Very often I think — especially when there’s a one-composer show — I wish that on the back wall of the stage they would erect a huge screen and show an over-life-size photograph of the composer, instead of the conductor getting all the credit. Let people get up and look at that portrait. Conductors, they think they’re almighty! What would they be without the composer? BD: This is one of the great things when you have a program with a living composer there. They bring him up on the stage to get the applause of the audience. BD: And every time that happens, I’m there cheering and screaming. It’s just wonderful. We have a lot of that here in Chicago. The chamber groups are always bringing in the living composers, putting them on the stage and doing their music. KH: When I lived in Detroit, that was one of my pet projects. My wife and I founded a chamber music society. BD: Let me just thank you for all you have done, and for sharing all of your adventures with a world-wide audience! KH: It has been my pleasure. 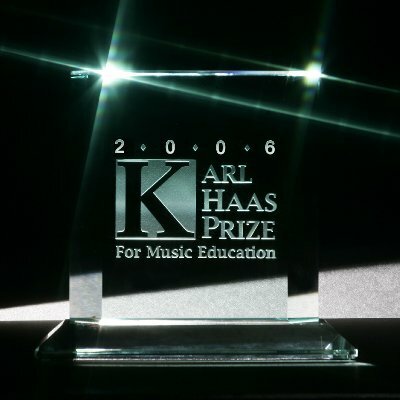 Karl Haas is the creator and host of the longest running daily classical music program in broadcast history, Adventures in Good Music. Using a new theme each day, he has delivered the classics to listeners around the world for over 40 years. Fleeing the Nazis, Haas and his family settled in Detroit, where he taught piano and commuted to New York to study with the legendary pianist, Arthur Schnabel. 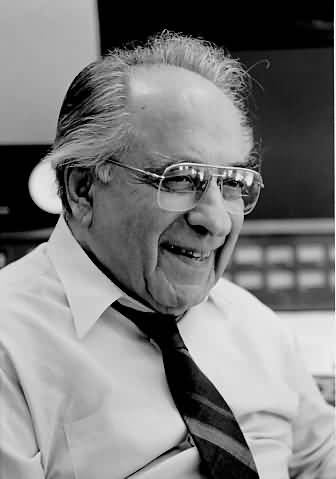 His broadcast career began at WWJ/Detroit in 1950, where he hosted a weekly preview of concerts performed by the Detroit Symphony. Soon the Canadian Broadcasting Corporation asked him to talk about the music on the air. In 1959, WJR/Detroit proposed a daily time slot for Haas to expand his commentary and, thus, Adventures in Good Music was born. Since 1970, WCLV/Seaway Productions in Cleveland has syndicated Adventures in Good Music to a worldwide audience. The program has received two coveted George Foster Peabody Awards during its long run, and Karl Haas has received the National Endowment for the Humanities George Frankel Medal. 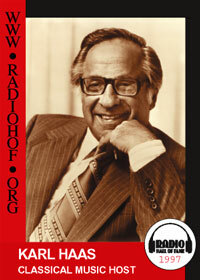 Karl Haas was inducted into the Radio Hall of Fame in 1997. This interview was recorded in Chicago on October 28, 1989. Portions were used (along with recordings) on WNIB in 1990 and 1994. This transcription was made and posted on this website in 2009.